6 bedrooms, 4 bathrooms. Country house split into 2 apartments let together. This is a large house split into 2 three bedroom, 2 bathroom apartments, sleeping 6 +1 each. The apartments are let together and both are included in the price. Ideal choice for two families holidaying together who would like some privacy as well as together space. Private swimming pool (10m x 5m) with beautiful views over the mountains. Near Filicaia, 4km from Castelnuovo Garfagnana, north of Lucca. 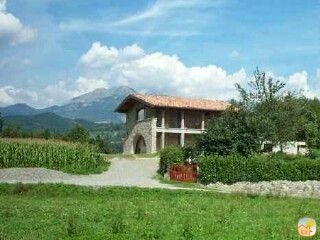 The property is located on farmland with stunning view overlooking the beautiful Garfagnana valley and the Apuan Alps. The apartments are comfortable and well furnished, retaining some original features including beamed ceilings, fireplace and interior stone walls. Individual outside eating area with BBQ. Owner’s property nearby, but complete privacy is respected. Shops and restaurants nearby, 5km from 6 hole golf course. Within reach of Lucca, Pisa & Florence. 2 Dining areas. Dining tables extend for large group. The owner has a house nearby but full respects privacy and does not use the gardens or the pool allocated to this house. As two families on joint holiday, we had an apartment each and were thoroughly delighted with the space and having the whole property to ourselves together with the freedom that brought us in terms of using the outdoor space - particularly the fabulous pool!! The apartments were adequately appointed and tastefully decorated. Mr Orsi, the owner, was a gem and maintained the pool and gardens himself. Even though we spoke no Italian and he spoke very little English, he was so delightful and helpful, it made our stay very enjoyable. We loved the location and had tremendous views out over the valley and quickly became familiar with the short drive to Castelnuovo for grocery items etc. (There are no local shops in easy walking distance) the larger e.leclerc was about half an hour away. We stayed for two weeks and found our way around relatively easily, with day trips to Florence, Pisa and Luca within easy reach. In the Garfargna Valley, we were able to find many interesting places to visit and activities to keep us occupied for the whole period, for example the high ropes course, horse riding and quad biking to name a few. We also enjoyed the 'climate' there in the valley, as on our trips out, we noticed the temperatures seemed a lot higher than back at the apartments... The pool was very refreshing and surprisingly cold!! There were ample sun loungers & outdoor seating for all of us! We made the most of the BBQ's and 'el fresco' dining. We enjoyed two weeks of beautiful blue skies every morning and endured one thunderstorm on our last night there! All in all a very memorable holiday for all the right reasons! We would definitely have no hesitation in recommending L'Argilla as a great place to stay - you have the freedom to tailor-make your own holidays, by being as active (or not) as you choose! Thank you for your really helpful review, and we are really glad you had a lovely stay! Electricity to houses in Italy is restricted (good 'Green' policy!) meaning that one cannot use too many appliances at once. For example oven and iron or oven and dishwasher etc. We will get the owner to check that there was nothing else wrong just in case! We hope to hear from you for another stay! Update 30 Jan: I understand from chatting with the owner that the time you stayed was a particular problem with electricity since he was having electric solar panels installed. This is all now complete so problems will not occur again! Our family of 6 had a very relaxing and enjoyable stay at this beautiful house. The owner is very friendly and helpful. The house is comfortable, clean and the facilities are excellent. The local town is only a few km's away and has lovely streets and shops to explore. We did day trips to Florence, Lucca, Pisa, Cinque Terre easily from this area. We would come back and stay again. Huset ligger ca. 7 minutters kørsel fra Castelnuevo. Et dejligt hus med god plads og en skøn pool. Udsigten fra poolen er bare fantastisk. Skøn have med aftenbelysning. Værten, Mr. Orsi er meget hjælpsom på trods af sit sparsomme engelsk. Thank you for your review - happy to hear you had a fantastic time. The owner will be happy to welcome you again. Prachtige omgeving, maar huis ietwat gedateerd! De ligging van het huis is geweldig evenals het zwembad, maar het huis, boven én beneden, heeft de nodige gebreken. Slechte bedden, bij elkaar geraapt serviesgoed, 1 slaapkamer die in verbinding staat met de woonkamer, doordat 1 muur niet helemaal tot boven dicht is, zodat de warmte én het ongedierte vrij spel hebben! En boven, de 2 aan elkaar grenzende slaapkamers die zo slecht geïsoleerd zijn dat je letterlijk alles van elkaar kunt horen!!! Vaste horren zou ook geen overbodige luxe zijn! Onze klamboes hebben hier wel nut gehad. Verder heb je nog een parkeerprobleem als er 4 auto's geparkeerd moeten worden, daar is te weinig plek voor. Maar de omgeving, het weer en het heerlijke eten maken veel goed! Thank you for your review. We are sorry to hear that although you loved the pool and views, that this popular house was not for you. The property is not in our opinion dated, but is a traditional Tuscan Property which has been restored as sensitively as was possible at the time to provide what is considered to be good value holiday accommodation when compared to other 6 bedroom properties in the area. We often have 4 families stay and parking 4 cars has never been a problem. I have passed your review onto the owner. Situated in beautiful surroundings within the Garfagnana area of Tuscany, perfect for relaxing or walking along the many footpaths. The local cuisine can be enjoyed at reasonable prices in the numerous restaurants of the area. Easy walking distance to the village of Filicaia which has a bar and basic local facilities. The house is well located for exploring the local market town of Catselnuovo which is a just over a 5 minute drive, the gorgeous and popular mediaeval town of Barga which is a 20 minute drive and the stunning walled mediaeval city of Lucca which is say 1 hour away. Pisa, with its leaning tower is a 1 hr 15 minute drive, and one can visit Florence in 2 hours. The famous Wind Caves are a 40 minute drive as is the local adventure park where one can try river canyoning! Closer to home there are plenty of little historic villages to visit, many of which have local festas in the summer. There are also the lakes of Gramalazzo, Vagli (with its hidden village submerged by the water) and Pontecosi, and some guests love to swim in the river. The property is also ideally located for visiting the local Fortress at Verrucole which is a good afternoon out, with stunning views and some interactive activities for the children. Also close by is the Buffardello tree climbing and zip wire park (ideal for both adults and children of all ages with a variety of runs) where one can take a picnic and spend the entire day in the welcome shade of the forest.